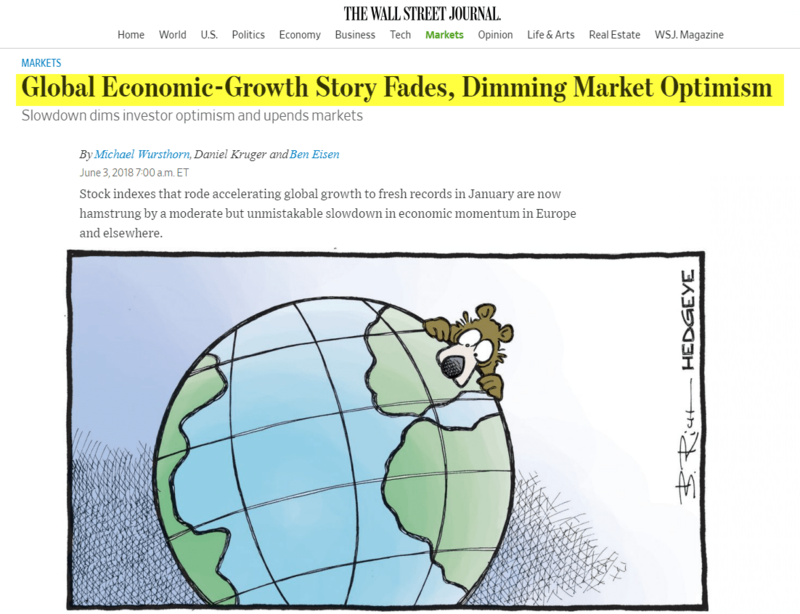 Here's the headline of a Wall Street Journal story this morning: Global Economic-Growth Story Fades, Dimming Market Optimism. We've been warning about #GlobalDivergences for 5 months now, as China, Europe and Emerging Markets contend with an increasingly difficult economic backdrop. The media is now aware of bubbling risk in Italy. This has brought attention back to the issues that have plagued Europe for the past decade: Deficits, Demographics and Debt. We call this "3D Risk" at Hedgeye. Here's a key chart. As you can see, heading into 2Q 2018, global growth will be bumping against seriously tough comps. What's this mean? The black bars in the chart below show the year-over-year average 2-year historical growth rates against which 1Q 2018 to 4Q 2018 economic growth will have to exceed to realize any growth. 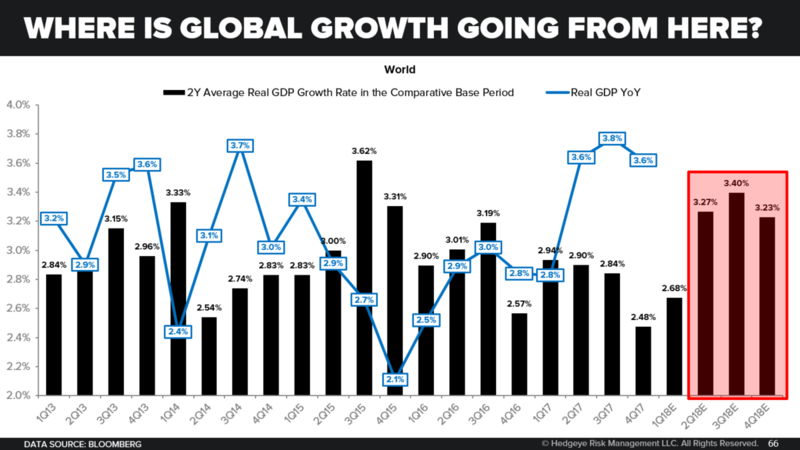 Basically, the steeper those black bars the harder it is for the global economy to grow. In other words, after a phenomenal, multi-quarter acceleration for the global economy the road ahead looks increasingly difficult. "Across Europe, it's an important day to be watching the bounce. Some are saying Italian and European risk is overdone. No. Europe has been a terrible place to have your money." If you haven't watched our 43-minute webinar (hosted by CEO Keith McCullough), we highly suggest you do. In it, McCullough explains our global growth outlook and what Wall Street's much-touted "synchronized global recovery" narrative missed heading into 2018.